Yubu Island was formed by sediment displaced by sea current as a result of sand flowing out of the Yonara River on Iriomote Island. It is a small island with a perimeter of approximately 2 kilometers that is 1.5 meters above sea level and located about 500 meters from the east coast of Iriomote Island. 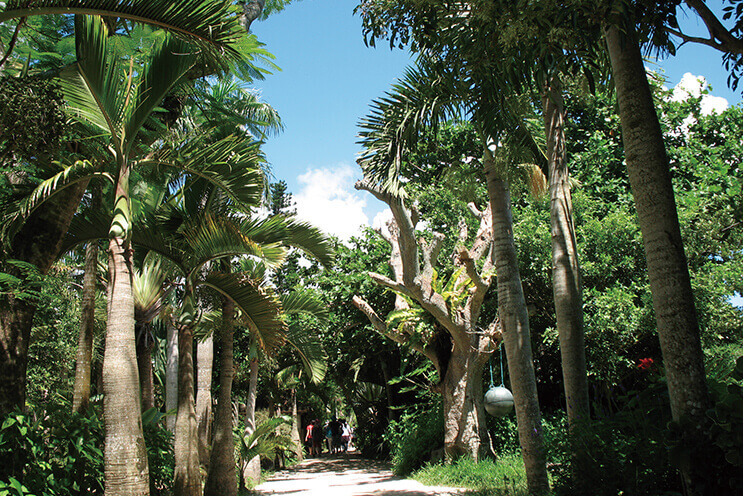 Yubu Island consists entirely of a subtropical botanical garden and has colorful tropical flowers blooming throughout the year. It is a popular spot within the Yaeyama Islands that hosts many visitors. It takes about 22 minutes on the fixed-route bus to the water buffalo carriage station from the Ohara Port on Iriomote Island. Taking a leisurely ride on the carriage across the sea and back is the popular way to enjoy it. 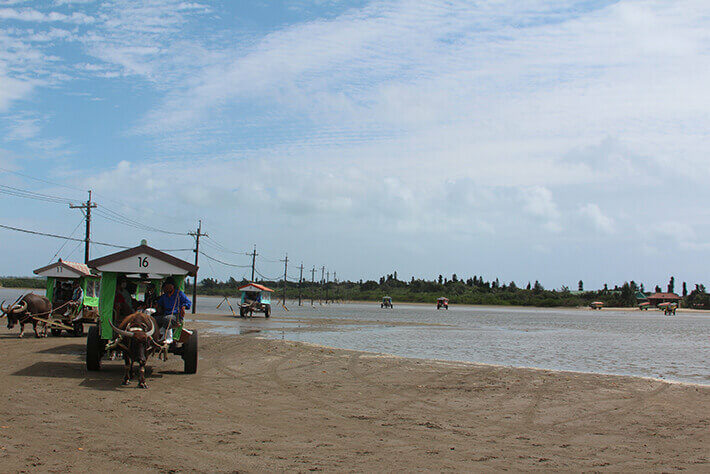 Enjoying your trip to the island is the real thrill of your journey to Yubu Island. The distance between Iriomote Island and Yubu Island is approximately 400 meters. The water buffalo move slowly over the shallow waters that can be crossed by foot. It certainly makes the list of tourist activities that represent Yaeyama. 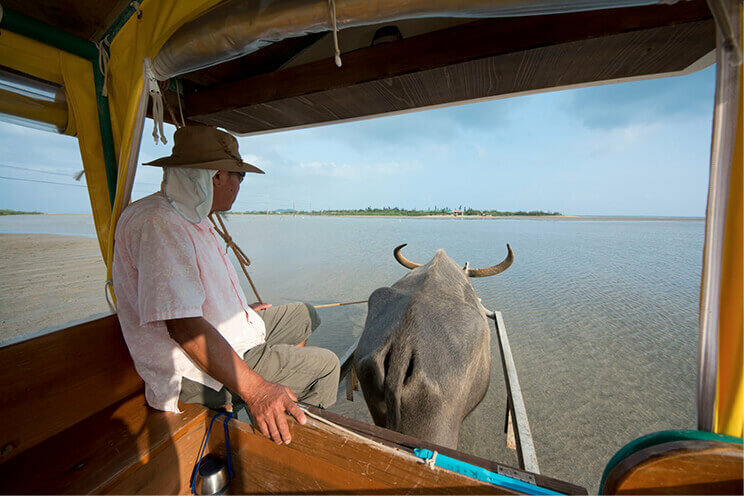 Although it depends on the weather and the mood of the water buffalo, it usually takes approximately 15 minutes each way. While listening to the sound of songs played on the sanshin, the carriage proceeds slowly toward the island. 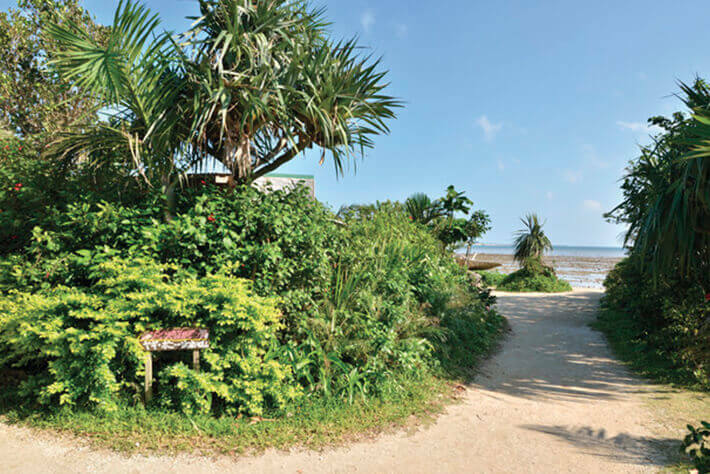 You can catch a ride to Yubu Island at the Traveler’s Station Yubu Island on Iriomote Island. 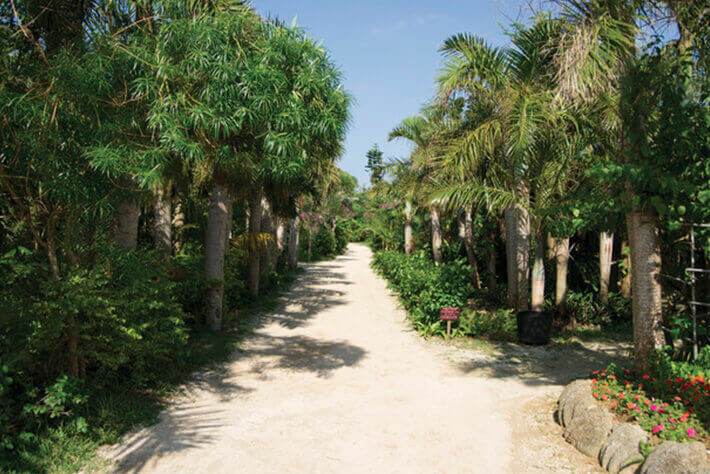 As a result of the typhoon of 1969, most of the residents on Yubu Island resettled on Iriomote Island, and only Mr. and Mrs. Masaharu Iriomote remained, planting palm trees, dreaming of creating a tropical paradise. 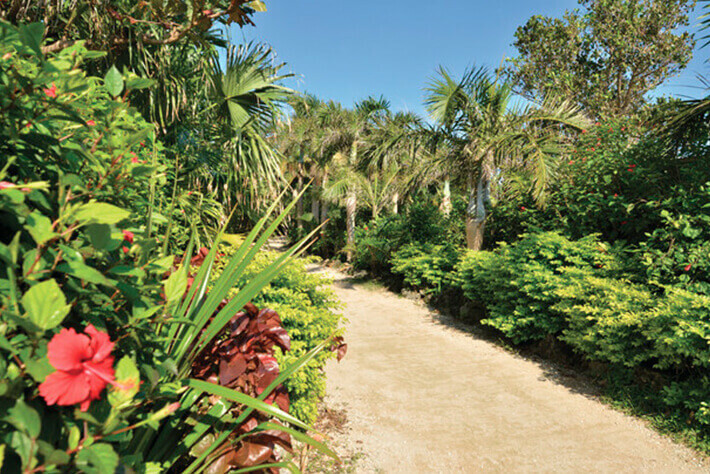 There are now over 40,000 palm trees that have been planted by the couple who dreamed of rebuilding the island. You can also enjoy various other plants particular to subtropical regions. The vividness of bougainvillea, which comes into season between late autumn and spring, is synonymous with the tropical scene. More than 30 kinds of bougainvillea bloom all year round at the Bougainvillea Garden. Within the botanical garden is a butterfly garden where you can find rare butterflies throughout the year, including the tree nymph butterfly, known to be the largest in Japan, as well as the Ideopsis similis, which is only found in warm climates, making the garden a popular spot to visit. 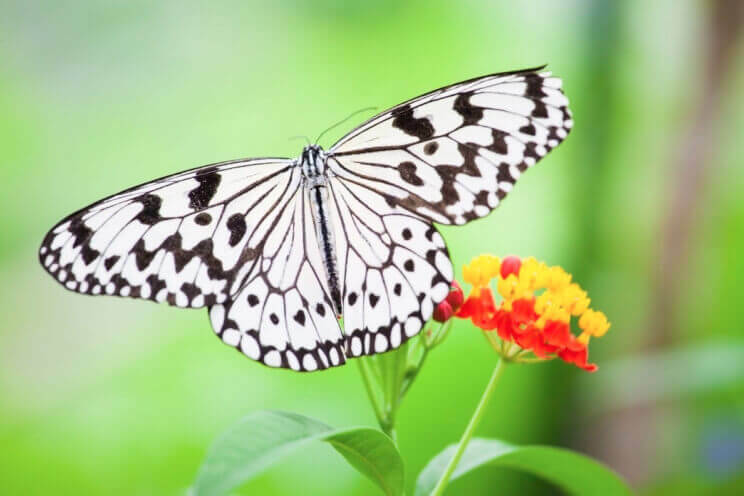 The scene of the butterflies fluttering about freely in the garden full of plants indeed gives the sense of a subtropical garden. You may even be able to snap a photo with the butterflies up close if you are lucky. 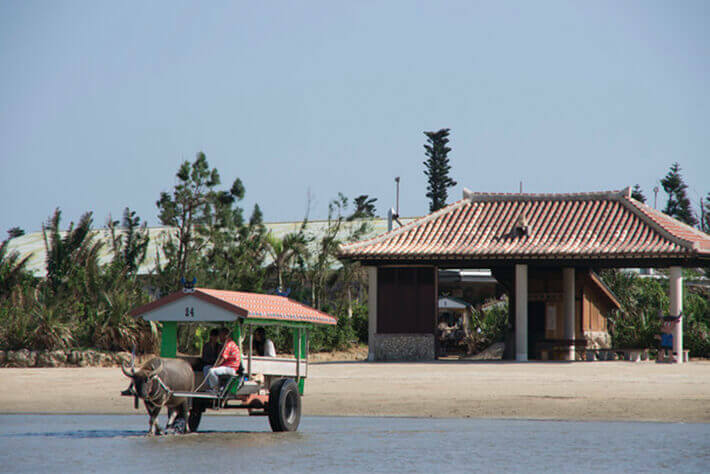 Ferry to Iriomote and water buffalo-drawn carriage to Yubu (15 min. ).